The terms atomic battery, nuclear battery, tritium battery and radioisotope generator are used to describe a device which uses energy from the decay of a radioactive isotope to generate electricity. Like nuclear reactors they generate electricity from atomic energy, but differ in that they do not use a chain reaction. 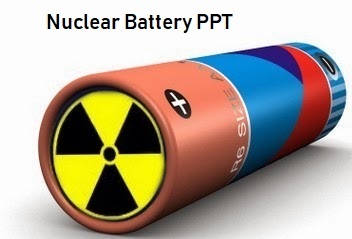 Compared to other batteries they are very costly, but have extremely long life and high energy density, and so they are mainly used as power sources for equipment that must operate unattended for long periods of time, such as spacecraft, pacemakers, underwater systems and automated scientific stations in remote parts of the world. 3. Evolution  Nuclear battery technology began in 1913, when Henry Moseley first demonstrated the beta cell.  The field received considerable in-depth research attention for applications requiring long-life power sources for space needs during the 1950s and 1960s.  In 1954 RCA (Radio Corporation of America) researched a small atomic battery for small radio receivers and hearing aids. 4. Conversion Techniques Conversion techniques can be grouped into two types :  Thermal: whose output power is a function of a temperature differential.  Non-thermal: whose output power is not a function of a temperature difference. 6. Thermionic converter  A thermionic converter consists of a hot electrode which thermionically emits electrons over a space charge barrier to a cooler electrode, producing a useful power output.  Caesium vapor is used to optimize the electrode work functions and provide an ion supply (by surface ionization) to neutralize the electron space charge. 7. Radioisotope Thermoelectric Generator  A thermoelectric converter uses thermocouples.  Each thermocouple is formed from two wires of different metals (or other materials).  A temperature gradient along the length of each wire produces a voltage gradient from one end of the wire to the other. 8. A photograph of the RTG that NASA's Apollo 14 mission carried to the Moon. The RTG is the gray colored device with cooling fins. 9. Thermo Photovoltaic Cells  Thermophotovoltaic cells work by the same principles as a photovoltaic cell, except that they convert infrared light (rather than visible light) emitted by a hot surface, into electricity.  Thermophotovoltaic cells have an efficiency slightly higher than thermoelectric couples and can be overlaid on thermoelectric couples, potentially doubling efficiency. 10. Alkali-metal Thermal To Electric Converter  The alkali-metal thermal to electric converter (AMTEC) is an electrochemical system which is based on the electrolyte used in the sodium-sulfur battery, sodium beta-alumina.  Efficiency of AMTEC cells has reached 16% in the laboratory and is predicted to approach 20%. 11. Stirling Radioisotope Generator  A Stirling engine driven by the temperature difference produced by a radioisotope.  New developments have led to the creation of a more efficient version, known as an Advanced Stirling Radioisotope Generator. 13. Direct Charging Generators  The primary generator consists of a capacitor which is charged by the current of charged particles from a radioactive layer deposited on one of the electrodes.  Spacing can be either vacuum or dielectric. 14. Betavoltaics  Betavoltaics are generators of electrical current, in effect a form of battery, which use energy from a radioactive source emitting beta particles (electrons).  A common source used is the hydrogen isotope, tritium.  Betavoltaics use a non-thermal conversion process, using a semiconductor p-n junction. 16. Alphavoltaics  Alphavoltaic power sources are devices that use a semiconductor junction to produce electrical particle from energetic alpha particles. Optoelectric  A beta-emitter (such as technetium-99) would stimulate an excimermixture, and the light would power a photocell.  Precision electrode assemblies are not needed, and most beta particles escape the finely-divided bulk material to contribute to the battery's net power. 17. Reciprocating Electromechanical Atomic Batteries  Electromechanical atomic batteries use the build up of charge between two plates to pull one bendable plate towards the other, until the two plates touch, discharge, equalizing the electrostatic buildup, and spring back.  The mechanical motion produced can be used to produce electricity through flexing of a piezoelectric material or through a linear generator. 20. Applications They have extremely long life and high energy density, and so they are mainly used as power sources for equipment that must operate unattended for long periods of time, such as  Spacecraft  Pacemakers  underwater systems  automated scientific stations in remote parts of the world. 21. Advantages  Life span- minimum of decades.  Reliable electricity.  Amount of energy obtained is very high.  Lighter with high energy density.  Less waste generation.  Reduces green house and associated effects.  Fuel used is the nuclear waste from nuclear fission. 22. Disadvantages  High initial cost of production as its in the experimental stage.  Energy conversion methodologies are not much advanced.  Regional and country-specific laws regarding use and disposal of radioactive fuels.  To gain social acceptance. 23. Conclusion Clearly the current research of nuclear batteries shows promise in future applications for sure. With implementation of this new technology credibility and feasibility of the device will be heightened.